This month's Japan Times article is about the elegant world of Kyoto jo-gashi, or high end wagashi (traditional Japanese pastries). The online version is divided into two parts: the main article The nostalgic and sweet life of Kyoto, and then the recipe-of-the-month, Serving green tea in your home which is actually about making iced matcha. You probably know that matcha comes as a bright green, very fine powder. If you're into making matcha, you may already have a chasen, the delicate bamboo whisk that is used to mix matcha with water. The whole mixing process is a critical part of the taa ceremony, and it's very beautiful. But you aren't conducting a tea ceremony, you don't need a chasen to make great matcha, especially iced! The easiest, though rather inelegant, way to mix the fine tea powder with water hot or cold is to just dump both in a cocktail shaker, as I suggested in the article. Close the lid and shake vigorously- voila, foamy smooth matcha! (Incidentally, I suggest boiling the water first and then cooling it down because that gives the tea a slightly cleaner flavor if using tap water. You can use bottled water if you like instead.) You can use a jar or any container with a tight fitting lid instead. Alternately, use a small whisk - I have one that I got in a cake-making kit aimed at kids - an whisk well until the tea is combined. You can make matcha latte by substituting warm or cold (if you're doing iced) milk for all or part of the water. I've already written about Kagizen Yoshifuka as part of my Postcards from Kyoto series. It's one of my must-stops whenever I've in Kyoto. The interior of the shop is surprisingly modern - but then, Kyoto has a number of very nicely designed modern retail spaces. Kagizen Yoshifusa main location: Higashiyama-ku, Shijō-dōri, 264 Gion-cho Kita-gawa. Tel: 075-561-1818. 5 minutes walk from the Keihan Shijō Station. The tea room is open 7 days 9am-6pm; there is a store in the front for purchase of hannamagashi and higashi. 2nd location at Koenji. Demachi Futaba: Kamigyo-ku, Demachi-dori Imadegawa-agaru, Seiryu-cho 236. Tel: 075-231-1658. 5 minutes walk from Demachi Yanagi Station. Takeout only. Kamo Mitarashi Chaya Honpo (main store): Sakyo-ku, Shimokamo Matsunoki-cho 53 (opposite the entrance to Shimokamo shrine). 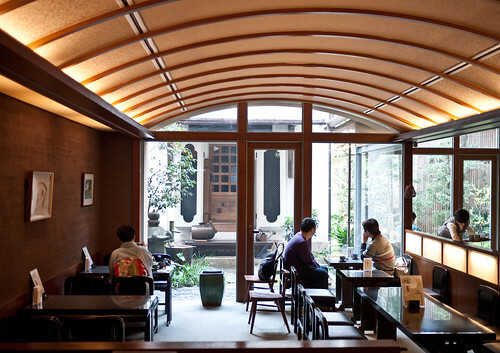 Tel: 075-791-1652 20 minutes walk from Demachi Yanagi Station, or take the Kyoto City Bus to Shimokamo Jinja-mae stop. Submitted by maki on 2011-07-22 13:34. Anyone else tried using an immersion blender to mix matcha? I've found that the easiest, lowest hassle way to make frothy cold matcha. of the best japanese patisseries in London paris new york and san francisco! be sure to check it out :-) will pass by all your recommendations if i (hopefully!) visit Kyoto! I love kyoto so much! thanks for your blog! Hi, my fiance and i are planing our next vacation and I would love to go to Japan next year. I was thinking Tokyo and perhaps Kyoto. I wanted to know if you could recommend me an travel guide. Thank you. Thanks for the info on wagashi! Great blog.